We can advice you with a pleasure the third (and unfortunately also the last) litter of our fabulous Villi is born 8.10.2002. 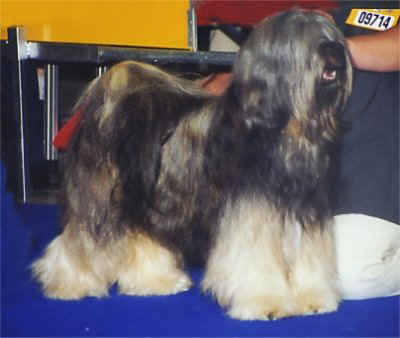 Father is a splendid German male - Multi Champion Tschal-pa von Nama-schu. Vill has seven puppies, five males (three sable, one tricolour and one black with white marks) and two females (black). See the first pictures, in a week, in two weeks, in four weeks, the first stroll and in nearly six weeks. Next pictures of our babies are in the photogallery. Our babies already have left us to their new homes. Tricolour male Jo-khang (Jogy) has a lot of beautiful snow-white friends in the kennel Enigmatic-Vittoria of Mrs. Karla Nemcova. Black girl Jomo Lha-ri stays with us! Tschal-pa is a strong beautiful male with wonderful movement and excellent coat. He has also excellent character. He has won res.CACIB in the World Dog Show 2001. 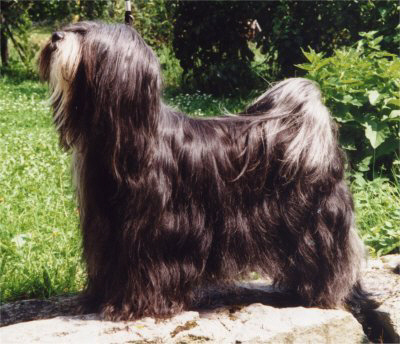 Tschal-pa is bred by Mrs. Anke Peine, and is owned by Mrs. Kathrin Heiler, Germany (kennel "Tschal-pa's"). Tschal-pa is eyechecked (free of PRA, PLL, cataract), HD-A (free of dysplasia). Villi is the most successful Tibetan Terier in the Czech Republic. She is bred by Jaana Myötyri-Ulmanen, Finland. Her sire is FINCH Karamain La Fontaine (FINCH, SCH Karamain Ramain-Dali-Pa x FINCH Cara Nor Ponya Gyalo du Kyil-Khor). Her dam is FINCH, ESTCH Amox Delicious Shag (FINCH Karamain Pan American x FINCH, Winner 89 Karamain Mata Hari). Villi is also eyechecked (free of PRA, PLL, cataract), HD-A (free of dysplasia).